I’ve been giving a lot of thought lately to the very long summer that has been various farmers markets, and the unreal amount of work that we put into them over the past few months. 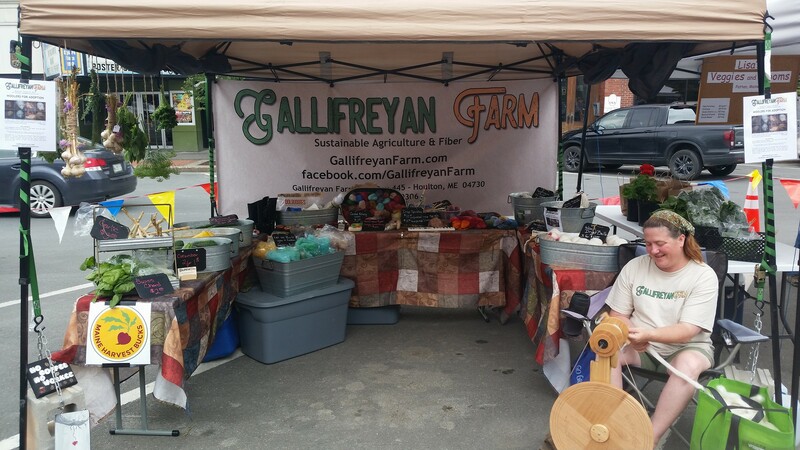 We were a mainstay at the Houlton Community Market this summer, and will be again next year. 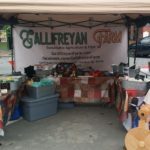 Not only did we get in a lot of networking and started to build up a fantastic customer base, but we met so many different people from every walk of life, all with a passion for fiber arts. From knitting and crocheting to felting and weaving, from all corners of the globe. It was an amazing experience. Beyond meeting so many people (customers, both new and existing), we made a lot of friends at market: the other vendors. Some sold bushes and trees, some sold hand-crafted sewn items, some sold their beautiful handmade jewelry, some sold veggies some sold home-made donuts… the list goes on and on. So many different things! So many different people! 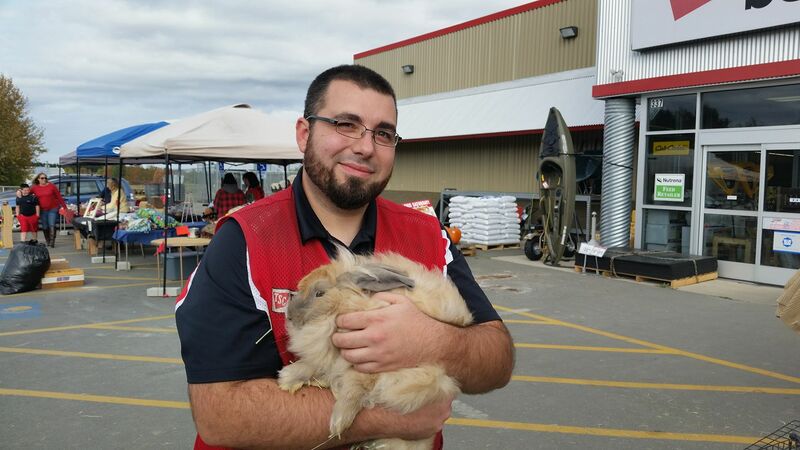 Jon @ TSC, taking a moment to get some bunny love. To be fair, we played hookie from one market… I almost think that was the weekend we went fishing with Dad. We missed anoter Market because we were at the Northern Maine Rural Living Days. One market day, we actually split up and half of us did Market, while the other half ran an angora “informational” booth at Tractor Supply. And, of course, today, instead of taking part in the last market day of the season, we opted to be at TSC’s “harvest market event”. We enjoy the TSC events. 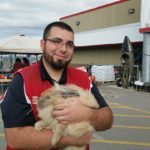 We’ve met a lot of great people (having bunnies with us really helps draw some attention), and have gotten to know the staff (and they us), and we’re really glad that there’s a good crew at our TSC. Jon, Whitney, Kate, Meagan… they’ve always treated us super well and are always appreciative when we show up at one of their events. But the wonderment came at a cost. We had to be in bed early every Friday night, to be up early enough on market day to load the truck, drive to the farm and tend the animals, then back into town to set up for market (or other event). Every. Single. Saturday. That’s 5 big plastic totes full of fiber and veggies, three tables, the 10’x10′ pavilion, a couple of camp chairs, four cinder blocks to keep the pavilion from flying to Canada… it’s amazing how much stuff can be packed into a little Ford Ranger …oh, and the weekly annoying Facebook Live videos. We might have to do a live video from the couch next Saturday, so everyone can see us watching cartoons and eating Cap’n Crunch. Through cold mornings, rain, wind, summer heat of 90+ degrees, we were out there, suffering vending along with our fellow vendors and friends. And while it’s called “Houlton Community Market”, is hadn’t been until the past few weeks that it occurred to me that the name didn’t refer to the community of Houlton… but to the community of we the vendors.